This is my absolutest favouritest snack ever, and I add 'Bengali' only out of political correctness. 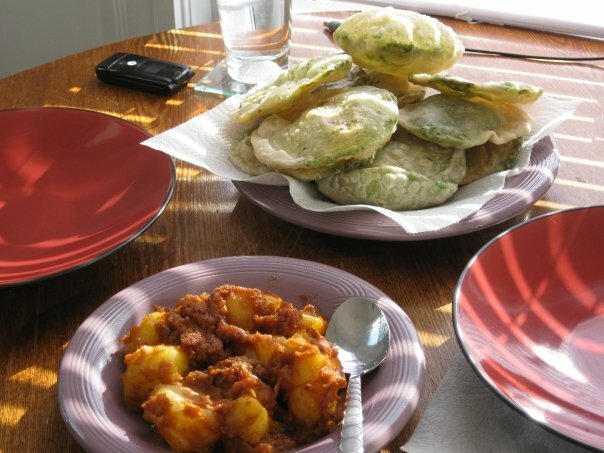 I'm absolutely sure -- completely bloody certain -- that nothing anywhere in this world (and probably beyond it) tops the deliciousness of this dish, which when added to a spicy, tangy potato curry, is often eaten as a meal. Sunday mornings in winter (when the peas are at their sweetest, succulent best) is not complete without koraishutir kochuri. And now my pleasure can be yours... except that, lacking an army of mothers, great aunts, great uncles, grandmothers and cooks who populate the kitchen and delight in feeding people upto the gills, you'll probably have to make this thing all by yourself. Poor you. But it will be so worth it. Peas, preferably from a pod but frozen works too. Ghee or sunflower/canola/vegetable oil for cooking and frying. Cumin, coriander and garam masala powder (optional). 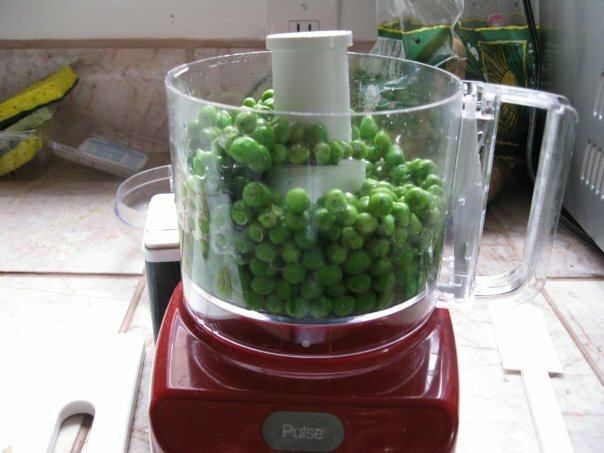 Put the peas and green chillies, with some salt and sugar, through the grinder/food processor. Some people like their pasted peas a little granular, some like it smooth. Pick your favourite. Now, heat about a tablespoon of ghee. Spread it around the pan, because pea-paste will stick. Add the paste two tablespoons or so at a time, frying it well. By the time you've added more than half the paste, it will begin to stick and turn brownish at the bottom and sides of the pan. Scrape it up with a spatula and mix it with the rest of the paste. Add more oil/ghee as you are frying (this will be necessary, unless you want to eat a paste of raw peas--and trust me, you don't). If you want the paste a little spicy, you can add a dash each of cumin, coriander and garam masala and fold it in well. Now, in a heap of flour, add some vegetable oil or two tablespoons of melted ghee. Drop some salt and a bit of sugar on top it, and mix the flour with this. Not all of the flour will be evenly mixed with the moyaan (ghee+salt+sugar), but that's okay. 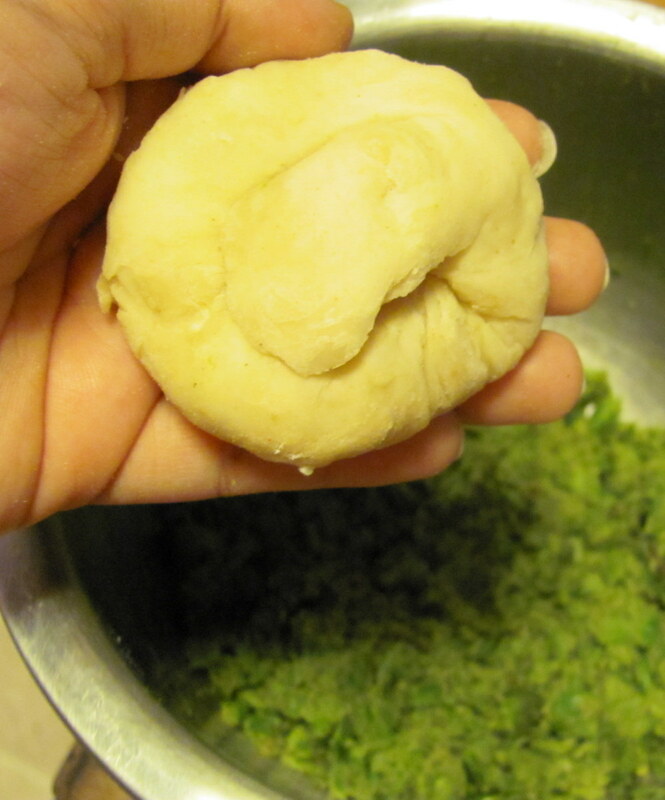 Now add warm water and make a nice, stretchy dough. The trick to making a lovely, springy dough is to add most of the required water at first (which makes the dough very sticky), and slowly keep kneading till the water mixes evenly and the stickiness reduces. Make little balls from the dough. Flatten them between your palms. Now make cups of each ball as shown below, put some cooked paste in it, and pull up the sides to seal it at the top. Then flatten the sealed ball with your palm, and roll it out with a pin. Heat at least four inches of oil in a wok (flat-bottomed ware will need a LOT more oil, so stick to a wok). When the oil bubbles, throw in a tiny piece of flour. If it floats up immedietly, the oil is hot enough. Lower the flame (or the kochuri will char) and slide in one rolled-out kochuri at a time. When the kochuri is in the il, turn the flame back on. It will -- or should -- puff up immediately, starting at the centre. Flip it when it's all puffed up so both sides are properly fried, then take it off the wok. Drain on a kitchen towel if need be. Serve with aloor dom (recipe later). I made chingri kosha. Good stuff but the prawns went rubbery because I was working. This looks complicated but desirable. It looks like a ravioli... but looks nummy. Ye gods! You always make me hungry!